The Percy Sailing Dinghy is ready for painting/varnishing this weekend with the seating, mast partners and final details being fitted in the next few days. The sponsors/students have decided on a cream sole and black to the waterline. Those who have dinghy’s know its easier to patch up and maintain painted surfaces then shiny varnished ones. Considering the disruption with bush-fires in the area and the excitement of the AWBF, students Wendy, Paul and Jacob; under the watchful eye of Mike, have made miraculous progress and i think you’ll agree the little dinghy is looking beautiful. In other news, there are some new and exciting additions to our stock in our shop at the centre. Francis is focusing his talents on chopping/cheese boards. These gorgeous tactile creations have hours of work in each, with the finished product smooth as silk. As well as the boards, Francis and his partner Christine create some stunning pieces out of the off cuts of the boat building materials such as articulating fish, tiny rustic chests of draws, earrings and key rings. Ruby and her new boat! The annual raffle draw has been won by Ruby Weaver-Burns of Moonah Tasmania. Ruby’s grandmother, Jenny Wilson, purchased a the winning ticket at the Wooden Boat Festival in Hobart. 16 year old Ruby is ecstatic about the win, still deciding if she wants to get the Foster 10 Huon Pine Dinghy in the water or keep it as a sculptural centre piece. With approx 75 tickets left the Wooden Boat Centre would like to humbly thank all those who purchased a ticket and took part in the raffle. The money raised will be utilised at centre, ensuring the continuation of wooden boat building in our area as well as making sure our beautiful community run centre has its doors open to educate and inspire future boat builders and enthusiasts. The Count Down to the Festival is on! With only 3 weeks until the Australian Wooden Boat Festival celebrations begin the Wooden Boat Centre in Franklin is a busy place to be! We are on Week 2 Day 5 of the Percy Sailing Dinghy Course. Led by our multi talented shipwright, Mike Johnson, the students have made great advances on the build. The transom, keel and stem have been constructed and today marks the beginning of the planking process! This is really starting to look like a boat! Make sure you come and watch the progression of the dinghy build and the students, Wendy, Paul and Jacob, demonstrating their new found skills at the Shipwright Village at the Australian Wooden Boat Festival in Hobart. Near completed Haven 12 in foreground and partially constructed Haven 12 in Tasmanian Timber donated by Hydrowood in the background. “Plenty busy here the last week, and all is well. We're closing in on the Festival Haven 12 1/2- less than 3 weeks to go! 1 week worth of woodworking, 1 week worth of finishing, and 1 week worth of hardware and rigging remains. We're trying to have the boat all but done a week prior to the Festival. The week of the festival we'll be packing containers and prepping all our boats and demos for the Festival. Planking has begun on the Franklin Haven. It's been a great teaching tool for those alums who haven't had much time with traditional boatbuilding. It'll likely have the majority of planks on it in the next three weeks. From there we plan to use it extensively as a demonstration tool during the Festival presentations. Friday-10am-11am: "Steam Bending Tricks for Boat Building". Saturday-11am-12pm: "Building the Haven 12 1/2-A Nathaniel Herreshoff and Joel White Masterpiece"
Monday-10am-11am: "Chopping Rabbets: Step by Step"
Betsy and I are also presenting at the Wooden Boat Symposium on Saturday afternoon. Left to Right: Students Wendy and Paul, Instructor Mike Johnson and Danish Student Jacob. The Wooden Boat Centre welcomes three students to the workshop for the next 8 weeks to build a Working Percy Sailing Dinghy. Wendy and Paul join us from NSW and Jacob joins us all the way from Denmark! The dinghy will be transported and worked on in the Shipwrights Village at the Wooden Boat Festival to showcase our courses and craft. The dinghy will be built in none other than the one of the finest Tasmanian timbers, Huon Pine, sourced from the West Coast. The course will be instructed by The Wooden Boat Centre’s, Mike Johnson and will be constructed using mostly traditional methods and hand tools. Kaci Cronkhite, well known boating journalist and author of 'Finding Pax: the unexpected journey of a little wooden boat: 1' will be visiting Franklin. Kaci is making a presentation at the WBC on January 14th at 6pm prior to dinner at the Living Boat Trust next door. Dinner will be cooked by the American boat building team, who know how to wield a spatula as well as a chisel. How is that for a double header? Dinner tickets can be purchased online at https://tinyurl.com/yae7rusd for $20. This is a fundraising evening for the Homecoming Regatta. The presentation will be held at the WBC and is a free event, only limited by the amount of space in our showroom. This month, we welcome a team of nine boat builders to the WBC work shed; including one Aussie, lead by Chief Instructor, Sean Kooman. The American team of North West School of Wooden Boat Building (NWSWB) alumni has joined us in the workshop as the 2019 Wooden Boat Festivals ‘featured nation’. 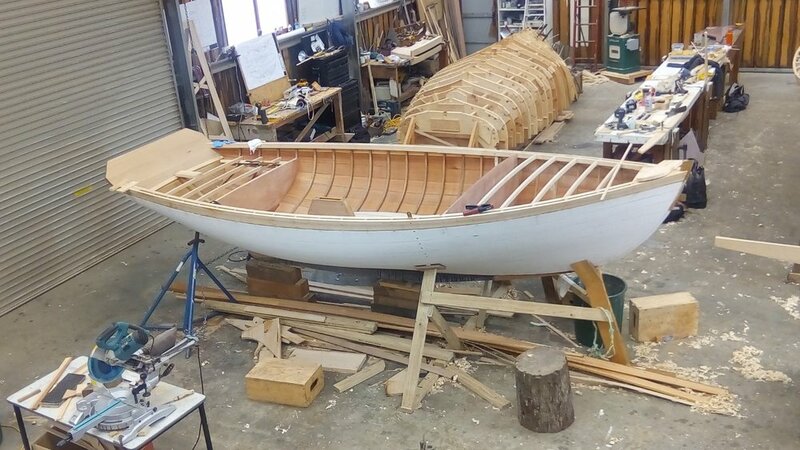 The team will continue the build on their Herreshoff designed, Haven 12 ½ with the intention of finishing in time for the MyState Wooden Boat Festival in February. The boat’s hull was constructed in the NWSWB in the U.S and will be finished here. The team will then challenge themselves beginning a second boat of the same design in our famous Tasmanian Celery Top generously donated to us by Hydrowood. Launch of "Two Islands" Sculpture in Franklin Square, Hobart. On Tuesday, a crew from the Wooden Boat Centre made their way to the Franklin Square in Hobart to witness the launch of “Two Islands”, an artwork by Nigel Helyer. The sculpture’s timber components were constructed in our workshop in Franklin by our resident craftsman Mike Johnson, Flo von Widmann, Peter Laidlaw, David Nash and Francis Shepard. “The Two Islands sculpture presents a metaphor that draws together histories of Tasmanian Aboriginal and European settler cultures in the form of two symbolic vessels. The skeleton of Sir John Franklin’s ship the HMS Erebus lies wrecked alongside a contemporary representation of a traditional Tasmanian Aboriginal canoe, creating a tension that resonates with the complex histories of Tasmania. Our team are very proud of our contribution. Last Saturday we spent a delightful , bright sunny day at the Huon Valley Show. As an agricultural show it is one of the best. Wood chopping. dog showing, large and small farm animals, cakes, jams, preservers, flowers and craft. food stalls, history groups you name it the Huon Show has it as well as huge numbers of visitors. Thank you to all who came and said “Hello” and bought a raffle ticket or two. We will be back next year. 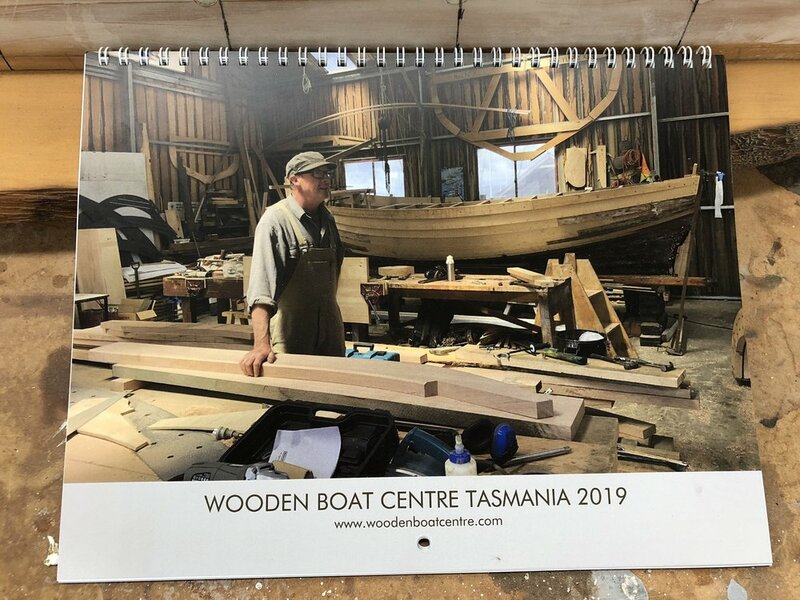 The Wooden Boat Centre has released its 2018 Calendar. The calendar features photos of courses, restorations and projects during the year as well as the people who make it all happen. The calendar also has the short course class list with all the starting dates. The calendar is just $20 plus $5 postage and handling if you would like one sent to you or someone special for Christmas. This project has dominated the workshop in the past couple of weeks. So much so that Adrian Dean would not be able to give his new workboat a trial if he was ready - it simply can’t get out the doors past the sculpture. The three pieces of the project will leave here on Wednesday morning bound for Hobart and the installation in Franklin Square. The dedicated work that has been done by the boat shed crew has been impressive. Nice to be part of Nigel Helyer’s public art project that is an important addition to the cultural landscape of Tasmania. The plywood Canadian Canoe is an easy early project for beginner boatbuilders. At least three of these will be made in March next year by student sponsors. They will be assisted by students of the Wooden Boatbuilding: Craft Career Course. We have been making some investigations about Visas as well as the receipt of ‘Youth Allowance’ or ‘Newstart’ for Australian citizens whilst studying. It seems so long as the workplace based training is considered to increase your employability skills the course should be able to be considered an ‘approved activity’. Please get in touch for further information. Have you ever wished to own a craftsman built clinker dinghy constructed in rare and now protected Tasmanian King Billy pine? If so, your dream can now become a reality. We are currently constructing a Foster 10 Clinker dinghy in this much sought after and highly prized softwood. 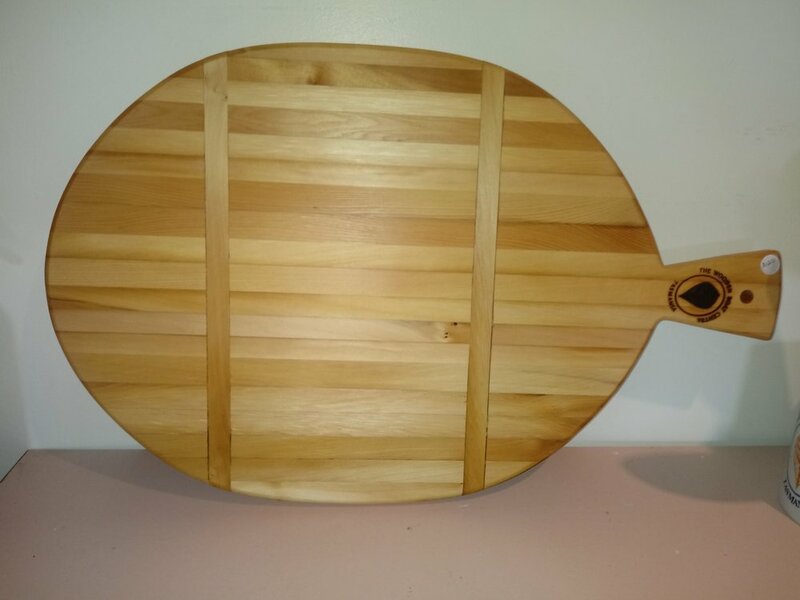 This craft is being offered for sale and could be yours on completion. “To get access to even a small plank of King Billy pine is to join a very select group. The items made from it will be the embodiment of its history.”- Tasmanian Specialty Timbers. The King Billy pine for this project was a very special donation to the Wooden Boat Centre by the Knoop family of Sandy Bay. We are honoured to be able to use it for this very special project. Please contact Anne Holst , manager of the Wooden Boat Centre, on 03 62663586 or anne@woodenboatcentre.com if you would like to own this unique piece of history. First King Billy Plank in position. Just eight days ago these large pieces arrived at the Wooden Boat Centre in Franklin. 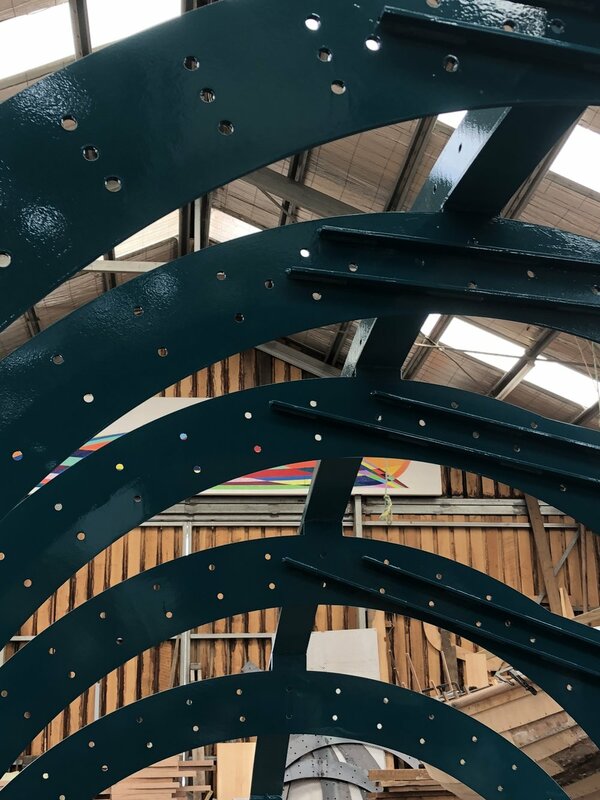 Over three weeks, these will be carefully covered by a myriad individually cut wooden pieces by the boatbuilders and artisans at the Wooden Boat Centre. They will then be transported to Hobart where they will become part of the history of Tasmania. This major public artwork by Dr Nigel Helyer was commissioned by the City of Hobart. “The artwork, titled Two Islands, will present colonial and indigenous histories relating to the site through a soundscape consisting of archival and community oral stories. The Wooden Boat Centre feels very honoured to have been given the task of creating this piece of Tasmanian history. Last week Colleen Shield , the Huonville manager and Tony Coulson, senior Community Bank Manager presented a cheque to members of the Franklin Working Waterfront Association. We were delighted to receive this Community Enterprise Foundation grant of $11,518 to assist us in purchasing tools to support planned boatbuilding courses for local, national and international students of the school to enhance their skills and knowledge of traditional wooden boatbuilding. Thank you Bendigo Bank. We are delighted to announce the release of our latest raffle. This exquisitely crafted Foster 10 Huon Pine Clinker Dinghy could be yours for just $10 a ticket. The dinghy was built by students in our seven week course earlier this year and has been beautifully finished. The prize also includes delivery to anywhere in Australia. Tickets are only $10 each and can be purchased at the Wooden Boat Centre in Franklin. You can also purchase by eftpos over the phone on 03 62663586 and we will scan the tickets and send them to you by email. You could also pop a cheque into the mail with your full details to The Wooden Boat Centre 3333 Huon Highway, Franklin 7113 and we will return the tickets by post. The raffle will be drawn at the Homecoming Festival here in Franklin on Friday 15 February 2019. There are only 2500 tickets available. The Wooden Boat Centre is offering two places on this build. Students will receive instruction from Seam Koomen and his team as they work together to build two vessels (one mostly pre-constructed and the other from the start). One of these vessels will be auctioned at the My State Australian Wooden Boat Festival in Hobart in February 2019. The tuition fee will be $4,800 for the eight weeks ( with Christmas holidays). The course will run from 10 December 2018 to 8 February 2019. Contact us on 03 62663586 or email us to express your interest. It’s the opportunity of a lifetime. Christina Kent, Francis Shepherd, Anne Holst, Julie Collins, Alan Cato and Graham Rankin in front of the metal work area that is having a facelift. On Thursday last week Julie Collins, member for Dennison, came to have a look at the works that have recently been done as part of grant funding received through a 'Stronger Communities' grant. This grant allowed us to replace an old section of roof on the upper workshop. It also funded materials for the reorganisation of the tool storage area under the Mezzanine, instalation of a door between the two bottom workshops and will see external painting of the bottom workshop soon, once it warms up a little. Thanks so much for this community support Julie. Akram, Mark and Kelvin attaching a plank. These three have proven to be one of the fastest, most competent dinghy building teams yet. Great work and a pleasure to have them in the shed.